NOTE: This content is old - Published: Tuesday, Sep 8th, 2015. Roads are being remodelled back to their stripy lumpy norm, after the Tour of Britain introduced us to a rare period of smooth motoring. As pictured above work is taking place to return the former raised zebra crossing between the Waterworld car park and Wrexham Library car park, a patch converted to flat tarmac for the finish line of the Tour of Britain, back to a crossing. As pictured below, the same length of road took on a very different look on Sunday with the finish arch being constructed along with two temporary buildings alongside to house the race officials and the hospitality area. Speed bumps were removed from Gwersyllt and Bradley, with various bollards also taken out and some roadways straightened and smoothed to ensure there was no incidents for the cyclists taking part in the Tour. The costs of the works are yet unknown, however several councils in North Wales who co-hosted the event will share the bill that is wrapped up in the overall cost of putting on the event. Back in February we wrote that the overall contribution from Wrexham Council was pencilled in at £40,000, however any surplus would run forward into the ongoing events budget for 2015/2016. @wrexham Watch out for the Italian on your left!! 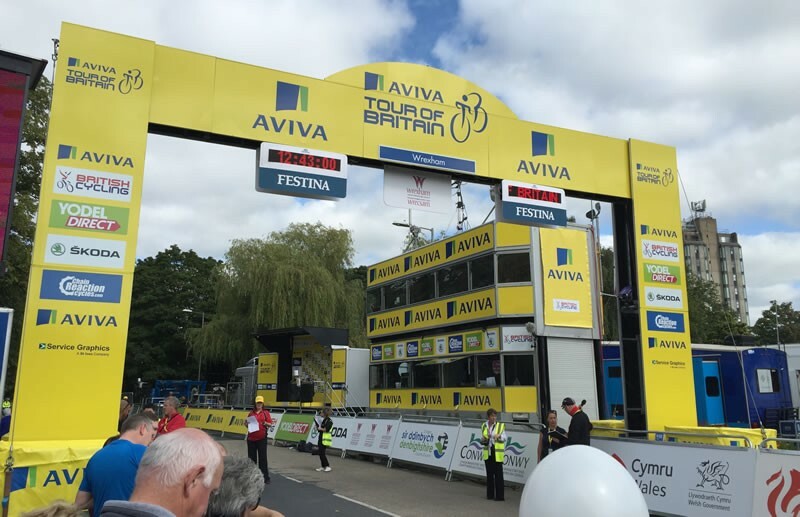 Cllr Neil Rogers said: “The Tour of Britain is the UK’s largest cycling race which attracted thousands to the town centre and was broadcast across Britain and Europe. I am certain that many businesses in Wrexham benefited from the influx of visitors to the area. The approximate cost of hosting the final stage of day one in Wrexham was in the region of £86,000.